The pig is one of the Chinese animal signs. 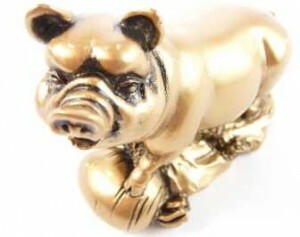 People born in the tiger, rabbit or sheep year benefit from a pig symbol in their office or home, as it will attract positive mentors into their lives. The good position for the pig symbol is in the North West of your office or home. You can put it on top of furniture.